Yes, I've been using the adorable Baby Bear stamp set again! How could I resist? It's just so darn cute! This is a baby card to celebrate the birth of a friend's latest granddaughter! Looks like Baby Bear could do with a hug from little baby Clara! This time I used three ink colours. The first layer is Sahara Sand, the middle layer is Crumb Cake and I finished with a layer of Early Espresso. I much prefer the darker last layer as it gives definition to the eyes and nose. 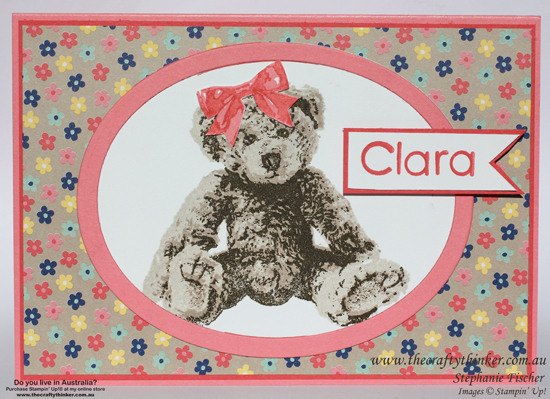 I stamped Baby Bear onto Whisper White cardstock and then used one of the Ovals Collection Framelits to cut it out. The bow is a two-step stamp process. I stamped onto whisper white cardstock and used Flirty Flamingo for the first layer and topped it with Watermelon Wonder. Then I fussy cut it and positioned it with a glue dot. The base card is Flirty Flamingo - one of the gorgeous new In Colours for 2016-2018 that will be available in the new Annual Catalogue on 1 June. I've added layers of Watermelon Wonder cardstock and Affectionately Yours DSP (also a new product). I cut a mat for the Baby Bear panel in Flirty Flamingo cardstock with the next size up Ovals Framelit. I stamped the baby's name in Watermelon Wonder using the retiring Back to Basics Alphabet set and trimmed it into a banner using the Banner Triple Punch. I made a mat for it with Watermelon Wonder cardstock and popped the banner up on some dimensionals. Live in Australia and want to buy the products? Click on an image below to shop in my online store.